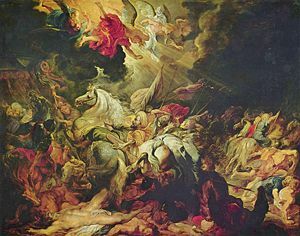 The Downfall of Sennacherib, an early work of Rubens. Sennacherib (in Akkadian Śïn-ahhe-eriba "(The moon god) Śïn has Replaced (Lost) Brothers for Me") was the son of Sargon II, whom he succeeded on the throne of Assyria (705 B.C.E. – 681 B.C.E.). In 701 B.C.E., an Egyptian-backed rebellion broke out in Judah led by Hezekiah. In response Sennacherib sacked a number of cities in Judah. He laid siege to Jerusalem, but soon returned to Nineveh, with Jerusalem not having been sacked. This famous event was recorded by Sennacherib himself, by Herodotus, and by several biblical writers. According to the Bible, the siege failed, as the angel of Yahweh went forth and struck down 185,000 men in the Assyrian camp (2 Kings 19:35). The Assyrian accounts do not treat it as a disaster, but a great victory, not revealing the final outcome. They state that the siege was so successful that Hezekiah was forced to give a monetary tribute, and so the Assyrians left victoriously. Part of this is indeed confirmed in the Biblical account, but it is still debated fiercely by historians. Some of the Assyrian chronicles, such as the stone carved Taylor Prism now preserved in the British Museum, date from very close to the time. In the Taylor Prism, Sennacherib states that he had shut up Hezekiah the Judahite within Jerusalem, his own royal city, like a caged bird. Sennacherib first recounts several of his previous victories, and how his enemies had become overwhelmed by his presence. He was able to do this to Great Sidon, Little Sidon, Bit-Zitti, Zaribtu, Mahalliba, Ushu, Akzib, and Akko. After taking each of these cities, Sennacherib installed a puppet leader named Ethbaal as ruler over the entire region. Sennacherib then turned his attention to Beth-Dagon, Joppa, Banai-Barqa, and Azjuru, cities that were ruled by Sidqia and also fell to Sennacherib. Egypt and Nubia then came to the aid of the stricken cities. Sennacherib defeated the Egyptians and, by his own account, single-handedly captured the Egyptian and Nubian charioteers. Sennacherib captured and sacked several other cities, including Lachish. He punished the "criminal" citizens of the cities, and he reinstalled Padi, their leader, who had been held as a hostage in Jerusalem. The Biblical account of Sennacherib's siege of Jerusalem is recorded in length. It starts out, though, with the destruction of the Kingdom of Israel and Samaria, its capital. This is how the ten northern tribes came to be known as the Ten Lost Tribes, because as recorded in II Kings 17, they were carried off and mixed with other peoples as was the Assyrian custom. II Kings 18-19 (and parallel passage II Chronicles 32:1-23) details Sennacherib's attack on Judah and capital Jerusalem. Hezekiah had rebelled against the Assyrians, so they had captured all of the towns in Judah. Hezekiah realized his error and sent great tribute to Sennacherib, undoubtedly the tribute mentioned in the Taylor Prism. But the Assyrians nevertheless marched toward Jerusalem. Sennacherib sent his supreme commander with an army to besiege Jerusalem while he himself went to fight with the Egyptians. The supreme commander met with Hezekiah's officials and threatened them to surrender, while hailing insults so the people of the city could hear, blaspheming Judah and particularly their God. When the King Hezekiah heard of this, he tore his clothes (as was the custom of the day for displaying deep anguish) and prayed to God in the Temple. Isaiah the prophet told the king that God would take care of the whole matter and that he would return to his own lands. That night, the angel of the Lord killed the entire Assyrian camp consisting of 185,000 troops. Sennacherib soon returned to Nineveh in disgrace. Shortly afterwards, while Sennacherib was worshiping in the temple of his god Nisroch, two of his sons killed him and fled, thus God protected His people and sent judgment upon him who had previously blasphemed God. Isaiah 37 describes Sennacherib as God's instrument in disciplining the children of Israel. Israel's defeat was regarded as divine punishment for the people's failure to keep their covenant with God, to forsake all other Gods and to live according to God's moral precepts. Lord Byron's poem The Destruction of Sennacherib ("The Assyrian came down like the wolf on the fold...") is a retelling of the story contained in 2 Kings. Sennacherib can also be found on the Terrace of Pride in Dante's Purgatorio. ↑ "Sennacehrib" at Easton's Bible Dictionary. Sennacherib Retrieved September 20, 2007. All links retrieved September 6, 2015. The murderer of Sennacherib - by Simo Parpola. This page was last modified on 6 September 2015, at 23:13.